Let me just start off this review by saying, please go pre-order The Tiger at Midnight because it is phenomenal, I haven’t heard enough buzz, and the spine is stunning. 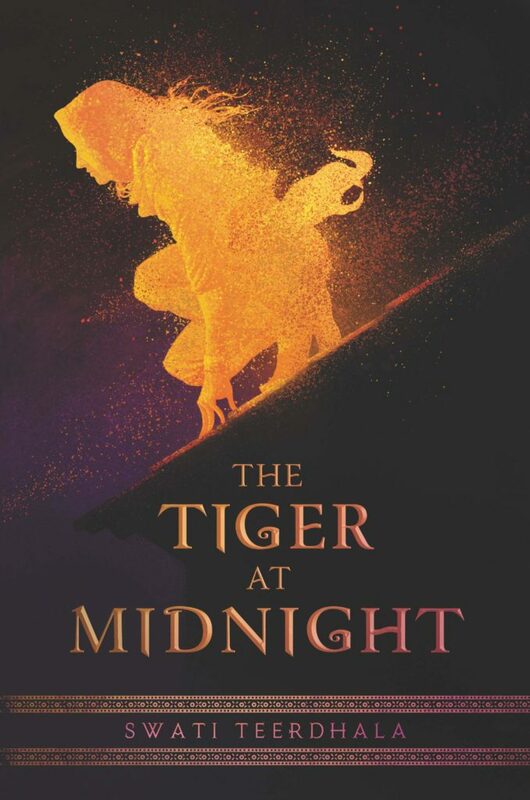 The Tiger at Midnight is a stunning debut fantasy book that will thrill you, make you scream, and wrench your heart. This dual point of view story takes you into Esha and Kunal’s heads as they dream of revenge, righting wrongs, and filling holes in their hearts with grief and retribution. Both Esha and Kunal come to question their roles in their revolutions, their duty, and exactly how far they’re willing to go for their dreams. Also let’s talk about how the banter in The Tiger at Midnight is some of my favorite of all time. These two precious characters might be some of my favorite and certainly one of my favorite ships of all time. Teerdhala takes my favorite trope – enemies to friends – and delivers a thrilling story of challenging what we’ve been taught. You can tell that The Tiger at Midnight is the beginning of a trilogy, not because of the pace or the story, but because there’s so much we still want to see. While I knew I was going to love Esha – you sarcastic, intelligent, whip wielding badass – I really fell for Kunal. (There’s also a side f/f relationship). Throughout the book, Kunal leaves the Fort and begins to see the world – the grime under the fresh layers of paint. The desert behind the mirage. Growing up in a fierce military mentality, questioning orders and any questions are not tolerated – especially in a war where there’s a narrative to fill. So as Kunal leaves the Fort, his eyes are opened to all the things they never told the soldiers: the actions carried out for ‘success’, the lack of water, the poverty, and the fear. And Esha’s journey is similarly heart wrenching as her relationship with Kunal challenges her mask. When we have this mask, literal or not, where we hide our feelings, our thoughts, our dreams, we begin to fall into a mask of being. When we forget who we are. And The Tiger at Midnight is about Esha and Kunal coming to terms with the idea that they’ve become too comfortable in their masks. Is it possible for them to be more than they ever thought possible? Once we know the face behind the mask, we can’t put it back. We will always see it show through in the cracks, to see beyond the legends, the rumors, the lies. We come to define ourselves by what we’re holding. Whether that be our quest for revenge, our own illusions, and what would it be like if we let go of that spark? If we let that fire burn out? The world building is so detailed it feels like we’re walking behind Esha and Kunal – like shadows in the night. Not to mention the society and political manipulations are just superb. It’s about a war fought between countries that used to be opposite sides on the same coin. A society, a coup, and the turning back of women’s rights. The Tiger at Midnight asks us if we should follow the rules, even if they aren’t right. When we are asked to do something that grates on our bones. That we can fell with every fiber of being is wrong. Is our duty more important than our morality? And at the end of the day, what do we serve? Do we serve an idea? Our home, our family, our country? Find The Tiger at Midnight on Goodreads, Amazon, Indiebound & The Book Depository. What is the last fantasy that you couldn’t stop raving about? I was already excited to read this one. Now I am super excited. The world building sounds great and I’m interested in the turning back of women’s rights. Thanks for reviewing this. I’m so excited you’re excited and the pre-order goodies are so gorgeous! Sounds like this should be required reading coming up to the elections in the US next year. Excellent review! I’m going to love reading this book for the characters, writing, and world. Plus, the question of morality that this book centers around will make me think about my own world and life differently. That is the best kind of book to read.